There are a few missing, the ones I’ve given away or hidden in people’s pockets. Plus a few in my own pockets, where I make them on the train and put them in a pocket for safe keeping. 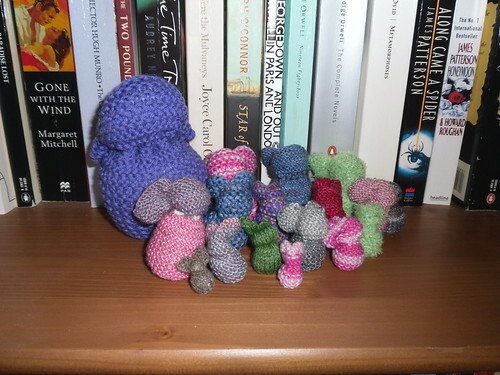 It feels quite productive – I can make a bunny on my way to Bristol, another on the way home and a third in my lunchbreak if I don’t go out. Craziness! 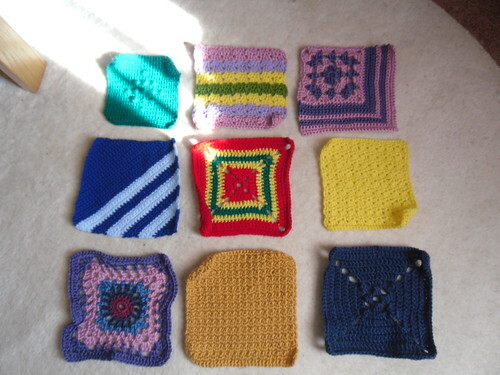 They are to send to a lovely lady on Ravelry who is making blankets for people who need them, using donated squares. Channelle lives here in Swindon, so I could probably hand-deliver them, but it seems easier to stick them in the post as I haven’t been driving much. If I get my act together they’ll go this morning, otherwise some time next week. It’s been quite good to practice my crochet skills, as I’ve never done very much. I hope they are up to scratch! Next I have promised to make a cross-stitch card for Chloe at work, who is going on maternity leave soon. Apart from the craft news, this week has been another rollercoaster. I was starting to feel better, went knitting in the library, getting my head together. Then I went to see the consultant on Weds evening and he shook me up again. At my request, while I was unconscious for my day surgery two weeks ago, he took a cervical smear. I knew I was due for one, and the idea of not being awake for it seemed appealing. Sadly, when the results came back this week they showed abnormal cells, at a level which needs further investigation. So I’m going in again for day surgery, to have a biopsy and some other tests done. I thought we’d simply be discussing hysterectomy – when, where, how and a load of other questions I had prepared. While he agrees that that is the only remaining treatment option, he isn’t equipped to discuss it without these further test results, as there’s a good chance they’ll affect the how and probably the ‘how much’ which I hadn’t even given much thought to. So, this coming week…Monday is a Bank Holiday so I get a long weekend. Tuesday I’ll go to Bristol. Weds I go in for day surgery. Thursday I try to recover somewhat. Friday, working at home. Not at all what I was expecting! This entry was posted on August 28, 2010 at 10:05 am and is filed under Health, knitting. You can follow any responses to this entry through the RSS 2.0 feed. You can leave a response, or trackback from your own site.